The two recently released Tamil action movies Vedalam and Thoongavanam are getting overwhelmed response from audience across the state in Tamil Nadu, despite of heavy rains. Both movies were released on the same day near Diwali i.e. 10th of November on 520 & 300 screens respectively in the state. 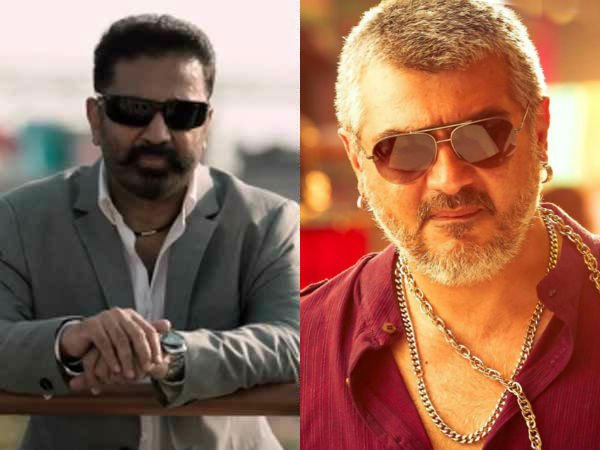 This is the biggest clash of Kollywood this year between two superstars Ajith Kumar & Kamal Haasan. Along with that, it is also a clash between a father & his daughter, because Kamal’s daughter Shruti Haasan is playing lead role in the movie Vedalam with Ajith. 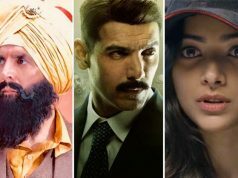 Both the stars have very high fan following among Indian audience and their movies also have good hype at box office. 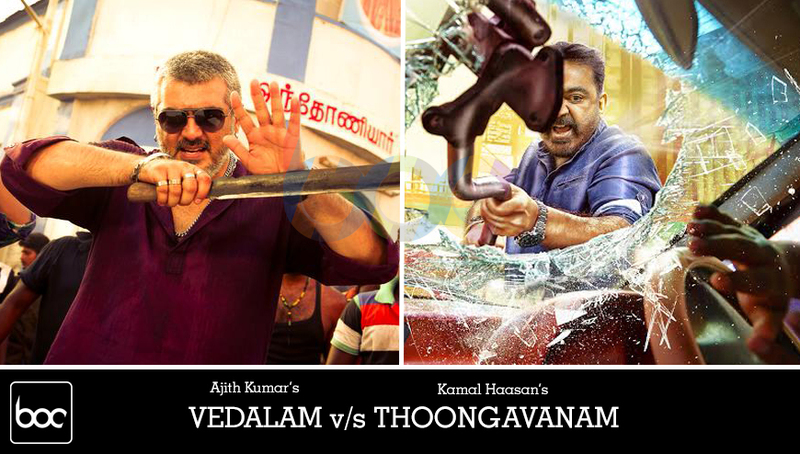 But as per reports, Vedalam is getting far better than Thoongavanam in terms of business. 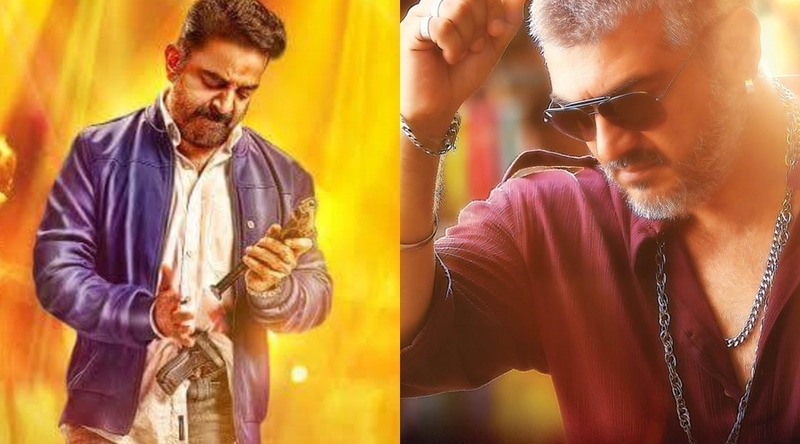 Both the movies have received positive reviews from critics but this time Thoongavanam acquired the higher position as it is getting more positive reactions from critics in comparison of Vedalam. 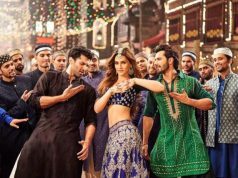 Overall these two movies are successfully entertaining their audience and collecting decent business figures in weekdays too. In its 7 days journey, Ajith Kumar’s Vedalam has grossed the total collection of 54.10 crores* that comprises with 15.50 crores of Tuesday, 10 crores of Wednesday, 8.50 crores of Thursday, 6.50 crores of Friday, 5.90 crores of Saturday, 5.30 crores of Sunday & 2.40 crores of Monday. Whereas the adjacent release Kamal Haasan’s Thoongavanam has grossed total 25.15 crores* that includes 9 crores of Tuesday, 4 crores of Wednesday, 3.25 crores of Thursday, 3 crores of Friday, 2.50 crores of Saturday, 2.30 crores of Sunday & 1.10 crore of Monday. Now they have entered in their second week and being weekdays both are getting less occupancy in theaters. On the 8th day of release, Vedalam & Thoongavanam have faced little more drop in the business and recorded the amount of 2 crores & 1 crore respectively.